USES: This medication is a combination of probenecid and colchicine. It is used to prevent gout and gouty arthritis in people who have frequent severe gout attacks. Gout is caused by too much uric acid in the blood. When uric acid levels in the blood are too high, the uric acid may form hard crystals in your joints. Usually gout symptoms develop suddenly and involve only one or a few joints. The big toe, knee, or ankle joints are most often affected. Probenecid belongs to a class of drugs known as uricosurics. It works by speeding up the removal of uric acid by your kidneys. This decreases uric acid in the blood. Colchicine works by decreasing swelling and lessening the build up of uric acid crystals that cause pain in the affected joint(s). This combination product is not a pain medication. You should not begin treatment with this medication during a sudden gout attack (flare). Doing so may worsen your pain during the attack. Follow your doctor\'s directions for treating a sudden/severe gout attack before you start taking this product. This product should not be used in children younger than 2 years. HOW TO USE: Take this medication by mouth, usually twice daily with a full glass of water (8 ounces/240 milliliters) or as directed by your doctor. If stomach upset occurs, this medication may be taken with food or antacid. To prevent kidney stones while taking this drug, drink plenty of fluids throughout the day unless your doctor directs you otherwise. Taking products such as sodium bicarbonate and avoiding large amounts of vitamin C can also help reduce your risk for kidney stones. Ask your doctor for more details. The dosage is based on your medical condition and response to treatment. To reduce your risk for serious side effects, do not increase your dose, take it more frequently, or take it for a longer time than directed by your doctor. Your doctor may start you on a lower dose and adjust your dose during treatment with this medication. After starting this medication, you may have an increase in the number of gout attacks while your body gets rid of extra uric acid. This may last for several months until the uric acid in your blood is lowered. Do not stop taking this drug if you have a sudden gout attack. Continue taking it along with the medications (such as colchicine, ibuprofen, indomethacin) prescribed by your doctor for gout pain. Avoid eating grapefruit or drinking grapefruit juice while being treated with this medication unless your doctor instructs you otherwise. Grapefruit can increase the amount of certain medications in your bloodstream. Consult your doctor or pharmacist for more details. Use this medication regularly to get the most benefit from it. To help you remember, take it at the same times each day. Tell your doctor if your condition does not improve or if it worsens. SIDE EFFECTS: Nausea, cramping, diarrhea, loss of appetite, dizziness, hair loss, headache, vomiting, and frequent urination may occur. If any of these effects persist or worsen, tell your doctor or pharmacist promptly. Remember that your doctor has prescribed this medication because he or she has judged that the benefit to you is greater than the risk of side effects. Many people using this medication do not have serious side effects. Tell your doctor immediately if any of these rare but serious side effects occur: muscle weakness or pain, numbness/tingling in your fingers or toes, pale or gray color of the lips/tongue/palms of hands, persistent nausea/vomiting, severe diarrhea, severe stomach/abdominal pain, signs of infection (such as fever, persistent sore throat), unusual bleeding/bruising, unusual weakness/tiredness, dark urine, yellowing eyes/skin. A very serious allergic reaction to this drug is rare. However, seek immediate medical attention if you notice any symptoms of a serious allergic reaction, including: rash, itching/swelling (especially of the face/tongue/throat), severe dizziness, trouble breathing. This is not a complete list of possible side effects. If you notice other effects not listed above, contact your doctor or pharmacist. In the US - Call your doctor for medical advice about side effects. You may report side effects to FDA at 1-800-FDA-1088. In Canada - Call your doctor for medical advice about side effects. You may report side effects to Health Canada at 1-866-234-2345. 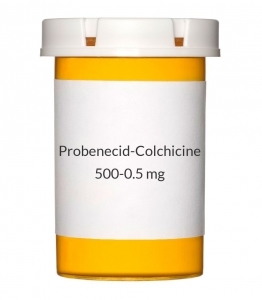 PRECAUTIONS: Before taking this medication, tell your doctor or pharmacist if you are allergic to probenecid or colchicine; or if you have any other allergies. This product may contain inactive ingredients, which can cause allergic reactions or other problems. Talk to your pharmacist for more details. Before using this medication, tell your doctor or pharmacist your medical history, especially of: blood/bleeding problems, cancer treatment, a certain enzyme deficiency (G6PD), kidney problems (such as kidney stones), liver problems (such as cirrhosis), stomach ulcer. This drug may make you dizzy. Do not drive, use machinery, or do any activity that requires alertness until you are sure you can perform such activities safely. Alcohol can decrease this drug\'s effectiveness. Limit alcoholic beverages. This medication can affect how well your body absorbs some foods and nutrients (such as vitamin B12). Consult your doctor or pharmacist for more details. Before having surgery, tell your doctor or dentist about all the products you use (including prescription drugs, nonprescription drugs, and herbal products). Colchicine can decrease sperm production, which may affect the ability of a male to father a child. Consult your doctor for more information. During pregnancy, this medication should be used only when clearly needed. Discuss the risks and benefits with your doctor. This drug passes into breast milk. Consult your doctor before breast-feeding. Your doctor may recommend that you separate the times you take your medication apart from breast-feeding. DRUG INTERACTIONS: See also How to Use and Precautions sections. The effects of some drugs can change if you take other drugs or herbal products at the same time. This can increase your risk for serious side effects or may cause your medications not to work correctly. These drug interactions are possible, but do not always occur. Your doctor or pharmacist can often prevent or manage interactions by changing how you use your medications or by close monitoring. To help your doctor and pharmacist give you the best care, be sure to tell your doctor and pharmacist about all the products you use (including prescription drugs, nonprescription drugs, and herbal products) before starting treatment with this product. While using this product, do not start, stop, or change the dosage of any other medicines you are using without your doctor\'s approval. Some products that may interact with this drug include: drugs that can increase uric acid in the blood (such as pyrazinamide, \"water pills\"/diuretics including hydrochlorothiazide). This medication can slow down the removal of other medications from your body, which may affect how they work or increase the risk of serious side effects. Examples include ketoprofen, methotrexate, pralatrexate, rifampin, antibiotics (including penicillin, cephalosporins), among others. Other medications can affect the removal of this medication from your body, which may affect how this drug works or increase the risk of serious side effects. Examples include azole antifungals (such as itraconazole, ketoconazole), cyclosporine, HIV medications (such as ritonavir), macrolide antibiotics (such as clarithromycin, erythromycin), telithromycin, verapamil, among others. Check all prescription and nonprescription medicine labels carefully since many medications contain pain relievers/fever reducers (aspirin, NSAIDs such as ibuprofen, naproxen) that can decrease the effect of this drug. However, if your doctor has directed you to take low-dose aspirin for heart attack or stroke prevention (usually at dosages of 81-325 milligrams a day), you should continue taking the aspirin unless your doctor instructs you otherwise. Ask your doctor or pharmacist for more details. This medication may rarely cause a certain serious (even fatal) muscle damage (rhabdomyolysis). This muscle damage releases substances that can lead to serious kidney problems. The risk may be increased if other drugs that may also cause rhabdomyolysis are taken along with this drug. Some affected drugs include: atorvastatin, digoxin, gemfibrozil, fenofibrate, pravastatin, simvastatin, among others. This medication may interfere with certain laboratory tests (including urine glucose tests), possibly causing false test results. Make sure laboratory personnel and all your doctors know you use this drug. This document does not contain all possible drug interactions. Keep a list of all the products you use. Share this list with your doctor and pharmacist to lessen your risk for serious medication problems. NOTES: Do not share this medication with others. Being overweight, drinking too much alcohol, and eating certain foods may worsen gout symptoms. Limit alcohol and ask your doctor, pharmacist, or dietitian about avoiding foods high in purines that may worsen gout (such as anchovies, bacon, beer, sardines, organ meats including liver/kidneys). Laboratory and/or medical tests (such as blood tests, kidney function, liver function) may be performed periodically to monitor your progress or check for side effects. Consult your doctor for more details.